NTI is committed to hands-on training programs and to developing work ready graduates who are sought after by employers. If you’re looking to make a positive change in your life – but you don’t have 2-4 years to spend in school – NTI could be the solution you’re looking for. Complete a professional training program and get into the workforce in as little as a few weeks. 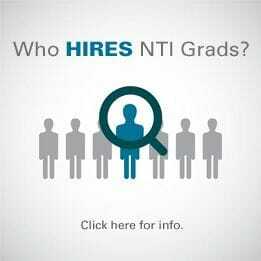 * If attending 2 or 4 years of school isn’t right for you, call NTI today. You can earn national certification and your career diploma in about 6 months*, and in just weeks if you attend the CDL Truck Driving or Phlebotomy program. Graduates of NTI are ranked among our best schools for retention and graduation rates. It is clear that the preparation and work put into your students at NTI coincides with what Schneider’s expectations.